In my Money-Making Magic Google Group, we have enjoyed some recent exchanges from members contemplating joining network marketing organisations. If that’s you too, here are a couple of resources I’d recommend, all of which I have found useful in the general business context as well as MLM, network marketing and sales. The first is Robert Kiyosaki’s book The Business School: For People Who Like Helping People*. I really like the idea of MLM as a way of creating a business. In the USA MLM doesn’t have the slightly dodgy connotations we give it in the UK. Americans regard network marketing as a great way to become self-employed and create a business to love. Good on them. It is precisely that as long as you do it right. And doing it right, in my book, means going beyond your friends and family and selling to strangers. You need to be a person who loves people and loves to help them with your product/service, perhaps a Supporter profile in Wealth Dynamics, but you do need to become comfortable in asking for the sale. I’ve built and run sales teams and I’ve loved it. As team leader, this is just another opportunity to coach and mentor people on how to be successful in running their own businesses. Although selling is not apparently in my profile, I love making sales and I find it really easy. That’s key. If you are not comfortable in asking for the business or don’t think you will learn to become so, then MLM is never going to be for you. My other tip is that you have to love, love, love the product and use it and be convinced of its benefits enough to champion them. 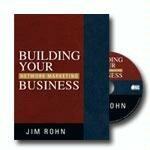 My next recommendation is a CD by Jim Rohn called Building Your Network Marketing Business. In this inspiring audio Jim shares stories which helped him to be massively successful in network marketing, imparting motivation and wisdom which goes beyond just the world of MLM and is useful for any business. My favourite story in the book is about carrying 10 little stones in your pocket and transferring a stone from one pocket to another each time you ask for the sale. Soon you learn that asking for the business is easy as you hone your pitch, and more importantly that every no takes you closer to a yes. In time you come to learn your strike rate, i.e. how many times in the 10 stones you get a yes or a no. And that asking is just a numbers game. I find the same in your real world business too: how many clients do you have to pitch to before you get the business and how to protect yourself from taking the no personally. It isn’t a rejection of you, its a no to your product or service and that no might be a no forever or just a no, not now. Knowing the difference and learning to distance yourself from the rejection is the key to success in networking marketing, MLM and sales. When I did this with the stones, I chose tiny pink crystals instead with lovely shiny finishes so that I loved to feel them in my pockets. The important thing to learn is how to offer your product to those you want to help and avoiding becoming the swivel-eyed pusher we all cross the road to avoid when we see coming. It’s a fine line and it’s got to be elegant and abundant, never desperate. If you are contemplating entering network marketing, MLM or sales, we’d love to have you join our Money-Making Magic Google Group. It’s free to join and its a community whose raison d’etre is about mutual support on your financial journey. We have written up some of our stories here on MyMoneyMoment and we intend to turn this into a book. You can join our MMMGG at that page. *Robert Kyosaki’s other book on MLM is called The Business of The 21st Century. You might also enjoy Jim Rohn’s seminal book Seven Strategies for Wealth and Happiness. One of the biggest reasons that people avoid business opportunities like network marketing is that they’re afraid of failure. Yes, a lot of people do fail in this business, and yes. You could also fail if you are not properly informed. Help to avoid failure in your business by learning more about network marketing strategies.